LATE physicist and novelist, Elechi Amadi, is best known for his play, Isiburu, a warrior character and wrestler and his famed exploits in that sport in ancient times. 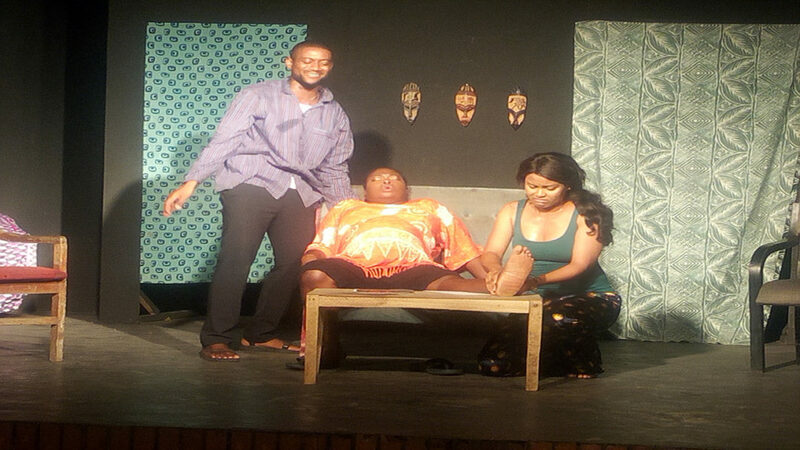 Performance of the play formed part of activities held to celebrate Amadi’s passing last year in Port Harcourt, aged 82. But Peppersoup is obviously Amadi’s less known play with serious dramatic and comedic import. Its recent performance was at the instance of Lagos Book and Art Festival (LABAF) 2017, held at the amphitheatre, Freedom Park, Lagos. Directing the play was Toju Ejoh for Royal House of Gold Productions. It is billed for a repeat performance at the same venue on December 3, 9 and 10. In Peppersoup, a young man, Ichela (Stanley Otulaka), latches onto the hope that a white woman he met on a music tour in London, would be his ticket out of poverty if only he could lure her to Nigeria and marry her. But the idea does not belong to him. His friend, Oti (Seun Kentebe), is the brain behind it all. After a failed music tour in London, Ichela returns to the familiar environment of poverty, strumming his guitar on an empty stomach. He has switched bands after Ori advises him so he could be on his own. So, Oti leads him on; he asks Ichela to propose marriage to Mavis (Osarehia Oransaye), his London catch, but Ichela is not so sure of himself. He does not know how to properly conduct himself before a white woman, with all those foreign mannerisms and etiquettes. But Oti is ready to give him all the coaching he needs to land his London wife, who will come to Nigeria and work also for his own upkeep. But Ichela’s long time girlfriend, Ineba (Tessy Brown), is lurking in the background as an obstacle. How does he sack her with a straight face? Oti provides him the perfect plan, but things go awry when Ineba announces she is pregnant. However, Oti steadies Ichela’s hand towards the golden prize, Mavis, who is on her way to Nigeria. With Oti’s help, Ichela learns the mannerisms needed to woo a white woman, the lies he needs to tell to maintain his chieftaincy status and such ridiculous posturing. But a pregnant Ineba is a looming factor. When Mavis arrives, things soon fall apart for Ichela, who finds himself in a love triangle, with Mavis and Ineba pulling him either ways. Mavis will not hear of sharing her man with another woman just as Ineba wants her man to herself. Of course, there is the initial fight between the two women. One explosive incident, however, changes the colouration of the affair and brings the two women together until things begin to fall into place again, with Wirie (Eriakha Edgar) providing the connecting dots. Indeed, Amadi is easily a master of the comedic act, as he weaves a hilarious tale of love, its duplicity, a friend as prank master and how a man caught in messy love triangle manages to ride the storm and find a semblance of peace; Amadi shows a deft hand in managing two women, caught out in a man’s mesh of lies, manage to make the best of a bad situation. Credit for the performance thrill also goes to the director, Ejoh. However, the play comes alive with the expert skills of Oti (Kentebe), who must egg Ichela on to contemplate the seemingly unthinkable. And when Mavis (Oransaye) arrives, the scenes literarily light up. Indeed, between Kentebe and Oransaye, Peppersoup takes a life of its own; they held the ace to its performance beauty.